Information Technology at the University of Oklahoma (OU) is going all out to tell the campus community about its services, including giving people lifts while sharing whatever's new on the technology front. 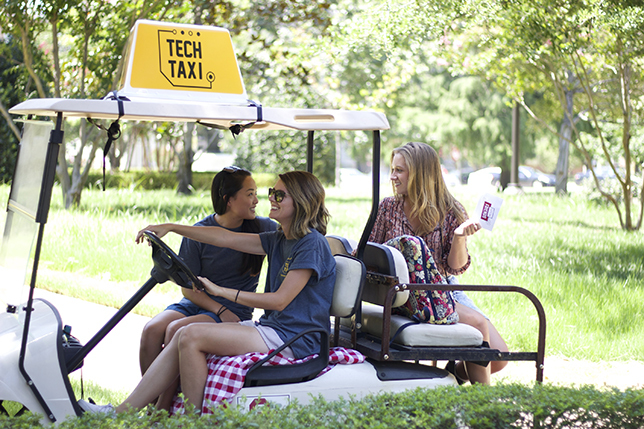 This summer the IT organization launched "Tech Taxi," an idea suggested by IT student interns. The free golf-cart service stops and asks people if they'd like a ride to wherever they're going next. Two people work the cart, one operating and both facilitating conversations. According to IT Marketing and Communications Coordinator Courtney Kneifl, once passengers are on-board, this captive audience gets to hear a short promotion about "the great things happening in IT: 'Have you heard about Office 365?' 'Are you using lynda.com?' 'Do you know about the new Couch Practice Space coming this fall?'" IT designers concocted a New York City cab-like "Tech Taxi" sign that sits atop the cart. People who take advantage of the rides have the chance to win prizes for answering trivia questions, such as VIP passes to concerts. To let people know to watch for the taxi, IT uses social media to broadcast the taxi's availability. So far the expenses to OU IT have been limited to the golf cart topper and swag items — less than $500, Kneifl estimated. The idea is unique enough that it recently won an honorable mention in the campaign category from the Oklahoma College Public Relations Association. Response among students, staff, faculty and visitors has been "overwhelmingly positive," Kneifl said. "We continue thinking of new ways to use it." For example, during the summer session people were offered free snow cones, and the tech taxi will be working during an August student orientation weekend. So far, she noted, the primary clientele has been made up of people visiting the campus "who have spent the day walking," students who are simply curious about the taxi and "anyone who wants to learn more about OU IT."